Officials fear the death toll from flooding in Texas sparked by Hurricane Harvey could soar once the water recedes from one of America’s most sprawling metropolitan centres. 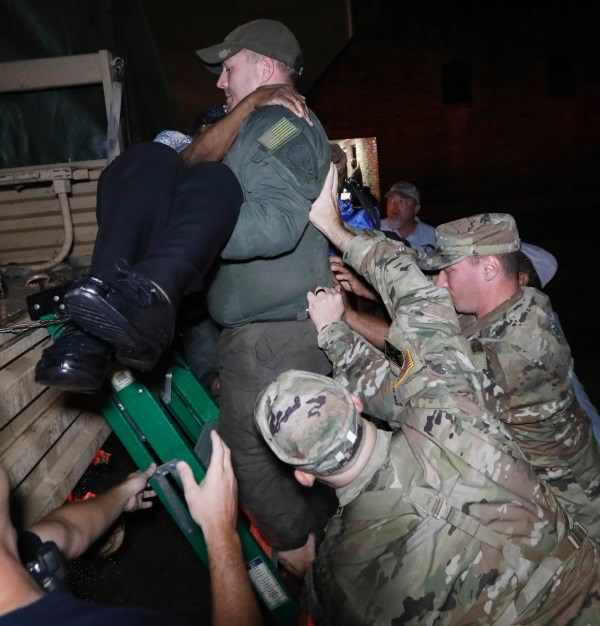 Crews have been overwhelmed by thousands of rescue calls during one of the heaviest downpours in US history and have had little time to search for potential victims. More than three days after the storm ravaged the Texas coastline as a Category 4 hurricane, authorities had confirmed only three deaths, including a woman killed when heavy rain dislodged a large tree on to her trailer home in the small town of Porter, but unconfirmed reports of others missing or presumed dead are growing. “We know in these kind of events that, sadly, the death toll goes up, historically,” Houston police chief Art Acevedo said. “I’m really worried about how many bodies we’re going to find.” One Houston woman said she presumed six members of a family, including four of her grandchildren, died after their van sank into Greens Bayou in East Houston, although emergency officials have not confirmed the deaths. Virginia Saldivar said her brother-in-law was driving the van when a strong current took the vehicle off a bridge and into the bayou. The driver managed to get out and urged the children to escape through the back door, Ms Saldivar said, but they could not. “I’m just hoping we find the bodies,” she added. A spokeswoman for a Houston hotel said one of its employees disappeared while helping about 100 guests and workers evacuate the building amid rising floodwaters. 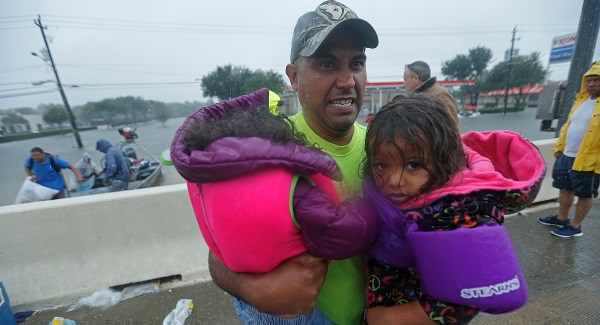 The disaster is unfolding on an epic scale, with the nation’s fourth-largest city mostly paralysed by the storm that has parked itself over the Gulf Coast. With nearly 2ft more rain expected on top of the 30in that has fallen so far in some places, authorities worry the worst might be yet to come. The Houston metro area covers about 10,000 square miles and is criss-crossed by about 1,700 miles of channels, creeks and bayous that drain into the Gulf of Mexico, about 50 miles to the south east. The storm is generating an amount of rain that would normally be seen only once in more than 1,000 years, said Edmond Russo, of the Army Corps of Engineers, which was concerned that floodwater would spill around a pair of 70-year-old reservoir dams that protect central Houston. 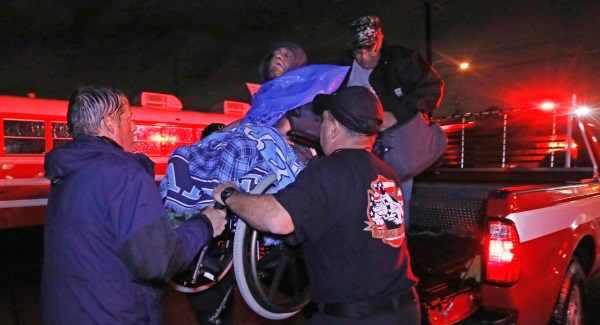 Rescuers are continuing to pluck people from inundated neighbourhoods, with mayor Sylvester Turner putting the number saved by police at more than 3,000. The Coast Guard said it had rescued more than 3,000 by boat and air, and was taking more than 1,000 calls per hour. A mandatory evacuation was ordered for the low-lying Houston suburb of Dickinson, home to 20,000 people, and questions continued to swirl about why the mayor did not issue a similar order for Houston itself. Mr Turner has insisted that a mass evacuation of millions of people by car was a greater risk than enduring the storm. By Monday night, 7,000 people had arrived at the city’s largest shelter set up at the George R Brown Convention Centre – which originally had an estimated capacity of 5,000. The Red Cross said volunteers made more space inside the centre in part by pushing some cots closer together. A shortage of cots means some people are having to sleep on chairs or the floor. Harvey increased slightly in strength on Monday as it drifted back over the warm Gulf, according to the National Hurricane Centre. Forecasters expect the system to stay over water with 45mph winds for 36 hours and then head back inland east of Houston some time on Wednesday. The system will then head north and lose its tropical strength. Before then, up to 20in more rain could fall, National Weather Service director Louis Uccellini said. That means the flooding will get worse in the days ahead and the water will be slow to recede once Harvey finally moves on.